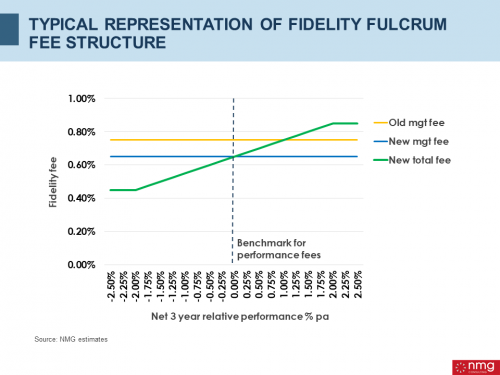 The market reaction to Fidelity’s introduction of a “fulcrum” management fee model in its UK fund range from March 2018 has been – well – a bit underwhelming so far. Objections have included that base management fees are not changing much, that total fees are still too expensive, especially if the fund underperforms, and that it’s too complex. 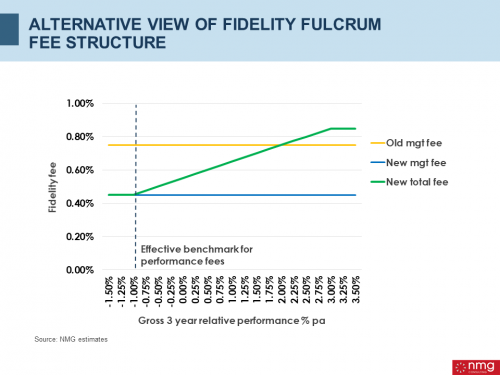 In summary, Fidelity will simultaneously lower the management fee by 10bps, and add a symmetrical performance fee of 10% of relative 3-year net performance, to a maximum of 20bps in either direction. This has been communicated with a diagram similar to that appearing as today’s Figure 1. It’s not the user friendliest diagram, and we’re not sure we’d want to try to explain it to a retail investor. However, from Fidelity’s perspective this structure improves alignment with customers, while responding to demands for lower headline fees. A 10bps fee reduction may not sound like much in a management fee of 75bps, but it’s a much larger proportion of profit margin which is being surrendered; or strictly speaking exchanged for potential performance fee exposure. That performance fee could turn out to be negative of course, so the potential reduction in profit margins in this new model could be substantial. You could understand if Fidelity is feeling a bit under-appreciated at this point, despite the room for improvement on communication. That said, we see an alternative way of thinking about the new fee structure which is less complicated and shows the change in a more radical light. This is shown in today’s Figure 2. In our alternative view, the maths is unchanged, but we’ve altered the perspective of the fees received by Fidelity from a net outperformance basis (ie after fees) to a gross outperformance basis (ie before fees). We’ve assumed total ongoing fees of 1.0%, which is not exactly right, but it’s close enough. In our alternative view, Fidelity is effectively lowering its base management fee by a much larger 30bps to 0.45% pa, but then receives a performance fee of 10% of 3-year returns above the fund’s benchmark less 1% pa (to 0.4% pa, but with no downside). This view reveals a much bigger change, and it’s also simpler to understand and explain – other than the oddity of performance fees kicking in slightly below benchmark. That makes the structure untidy, but all performance fee structures are somewhere between complex and mind-bending. What is much clearer in our alternative view, however, is that this is a big deal, with Fidelity effectively exchanging 40% of its base fees for a relatively conventional performance fee, albeit with an unconventional performance benchmark. This is a brave step towards fairer pricing. It puts the right issues on the table but there is more to be done to address them. What is the right base management fee? What is the right performance benchmark and how much of that outperformance do managers deserve? And will we be able to explain it to investors?